Compact spill kit designed for service vehicles, transport trucks, small workshops or any location where storage space is at a minimum. 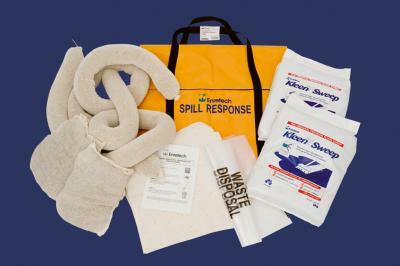 Suitable for use at any ‘medium risk’ area, to contain and clean up liquid spills. Effective on fuels, oils, hydraulic fluids or any other liquid spill or leak that occurs in a controlled industrial, commercial, transport or marine environment. Highly absorbent, effective and competitively priced. 16 kits per pallet. 2. Comes in large orange hanging bag + straps. 3. Absorbs up to 126L (oil) – confirmed by independent testing. 4. Compact kit. Highly visible, safe and easy to use. Capacity for extra PPE.